Delighted Momma: Do You Thrift? I recently got back into thrifting and oh how I missed it! I used to go thrifting so often that I dedicated a whole series to it, ha! If you have been a long time reader you might remember that. I love the thrill of finding one of a kind things that truly are little treasures. Lately I have been on the hunt for unique coffee mugs, glassware and artwork for my home. But sometimes you find the best things when you are not necessarily looking for them. A giant original oil painting for my husband's home office. Ian is a mountain man at heart and this was perfect for him. 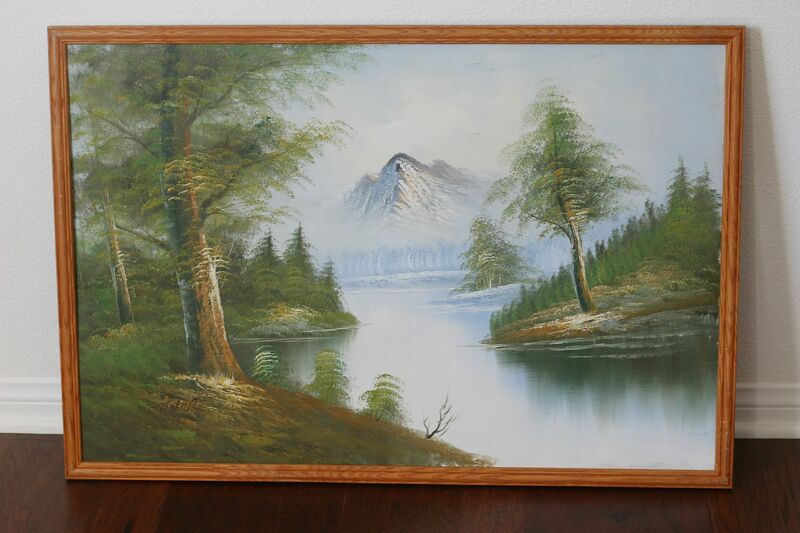 I got it for $10. You can't beat that. A happy little mug to add to my growing collection of mis matched dishes. It was .25. 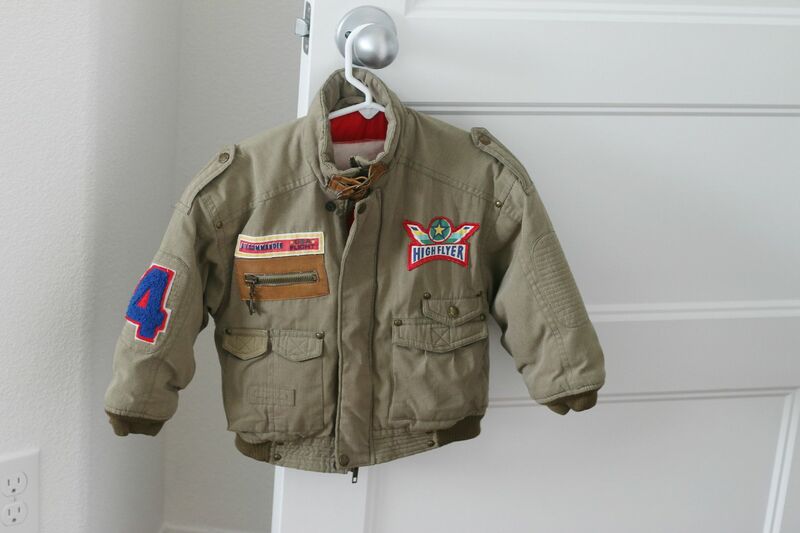 A vintage bomber jacket for Ronin. This was just too awesome not to get. $3 well spent in my opinion. Do you thrift? If so I would love to hear what you look for when you do. Great finds! I mostly shop for myself. I've found some awesome green skinnies, the exact Gap jeans I was saving up to buy, and much more at our local Goodwill. I need to get better at finding home decor. I also love finding old mugs! 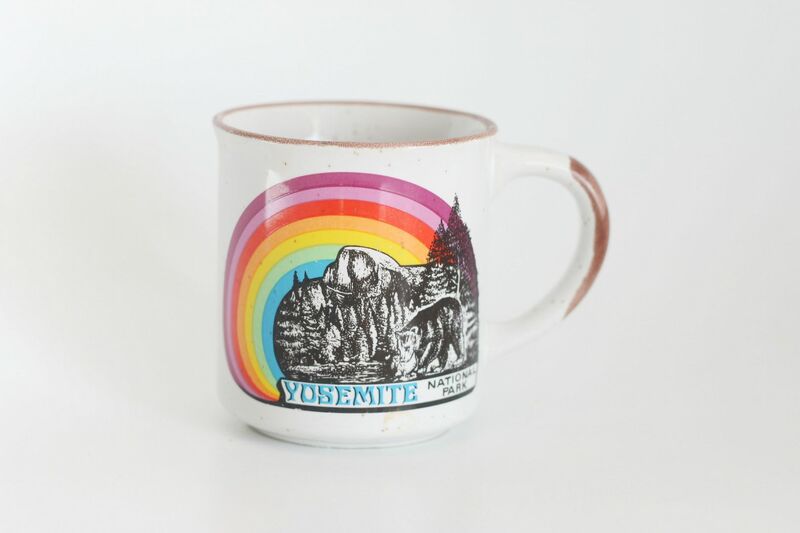 Love the Yosemite one you found. I personally don't thrift, but my sister and dad do! They get all our dog toys (my dogs tend to be destructive on toys) as well as pretty much anything, for me, I am ALWAYS asking for mason jars! All shapes and sizes welcome! That jacket is sooo cute!!! I miss your thrifting posts! i used to do it more when i lived in my old apartment - there was a tiny, unpretentious vintage store around the corner that specifically benefitted a jewish charity, so when a lot of older (and usually wealthy) members of the synagogue passed away all their stuff would go here. needless to say, i found amazing things there. after every run i would usually pop in. the best finds were old silver and china, but they had amazing deals on furniture (like old, beautiful, wood furniture) that i just didn't have space for. also jewelry and i did get a nightstand and an an old trunk that my TV is on. sigh. you've made me miss it so much lol! Ahh, I need to start thrifting! Since we moved, I have still never made it to Goodwill or the Antique Market in the next town. Your finds are awesome! In my previous thrifting days, I always looked for home decor and items for our outdoor spaces. My favorite find was a cool outdoor pump that I put in my flower beds. Some of my favorite clothing items, ones that I constantly get compliments on, are from the local thrift shops. I have found lovely jewelry for a steal, purses that are to die for, baskets (which are absurdly expensive new), cast iron cookware (also expensive new)... all sorts of goodies. adorable jacket! what a steal! !